On Saturday night, X-FM made a long broadcast of music and requests while announcing a phone number. It was the best that I've heard X-FM in a year or two, but a lot of those difficulties were probably because of my antenna mast collapse. Still, the signal was excellent for the duration of the broadcast, and it was great to be able to sit back and enjoy the show. 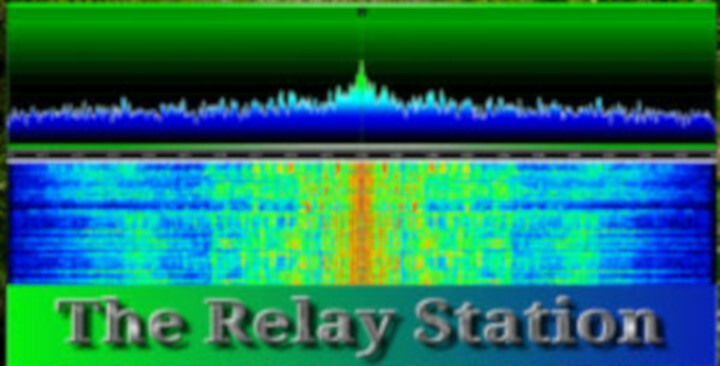 I was curious about just how well the signal was getting out & I started checking SDRs around the world. The X-FM signal ranged from barely audible to very good at these locations (in no particular order): SW England; Rio Grande da Serra, Brazil; Bjargtangar, Iceland; Kongfjord, Norway; Carlow, Ireland; Wrexham, Wales (carrier); Anasco, Puerto Rico; Maui, HI; & Bonaire SDR. I didn't stay up for the sign off to see if the signal made it into New Zealand, Australia, or Japan, but maybe? Radio Voyager: 6950, 4/21, 2310+ Pink Floyd “Us and Them,” then a jazz song with lots of improvisational piano. 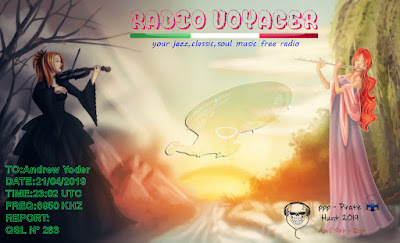 An announcement or ID by a woman, then a male computer voice with the Radio Voyager e-mail address. A song with a woman singer, maybe Motown or soul? 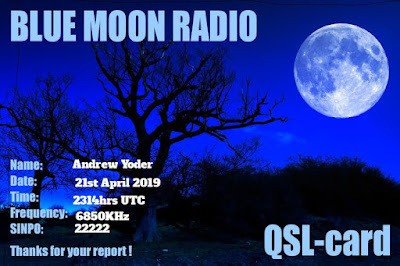 Blue Moon Radio: 6850, 4/21, 2314+ The signal was very weak but audible. I could hear music throughout, without many problems of deep fading. But aside from the signal being too weak for me to know the words, I just didn’t know any of the songs. HF Underground DXer Skipmuck heard a lot of the songs and mentioned that they were being played on a loop. My guess is that was just for the night and that it switched back to live programming this morning. 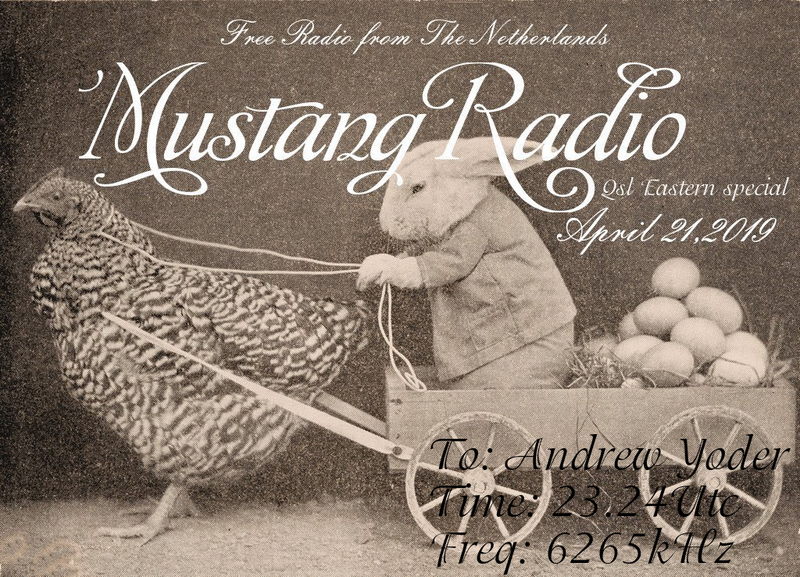 I checked the Twente web receiver the next day and listened to the station again. One thing from listening on Twente is that your music levels sound good, but the mic levels are really weak. Even though the signal is very good in the Netherlands, I had to turn the audio output up about the whole way to be able to understand the announcer. The operator said he's using "25 watts and a half wave dipole. Over the past few days we have received reports from throughout Europe, Scandinavia, Ukraine, Russia, and east coast of USA." Last night, I was working outside, scraping and painting the house. I don’t remember why I needed to go inside (maybe to take our dog back inside because she was barking at people walking down the road? ), but I did. When I went inside, I checked HF Underground and saw that Skipmuck in Massachusetts was hearing the European pirate Radio Cuckoo and IDing a number of songs, so I thought I might have a shot. I ran up to the radio, locked in on the signal and managed to ID one song after fighting through static and the drone of my receiver’s drifty sync lock. 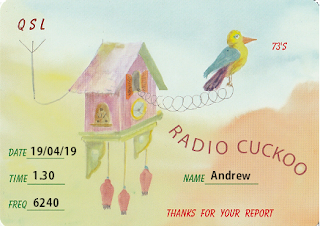 Radio Cuckoo: 6240.3, 4/18-19, 2342-0042+ Really tough copy, but some signal was audible throughout. In many cases, all I could hear was a beat, but I had Gary Numan "Cars" fade up nicely. In the last 30 minutes, it seemed to be fading away, but then it came back for a really nice fade up. Also heard an announcement and possibly an ID and e-mail address. I sent a reception report with a couple of audio clips to the station today and received a nice e-mail and eQSL back. Power is between 40 and 50 watts, and the station is working on a much more powerful transmitter. When that happens, it should be audible across much of the East Coast of North America. Jorge Garcia sent a bulk e-mail (& posted on HFU) that he'll be testing a beacon transmitter on 6342 kHz CW tonight starting at 2200 UTC with 20 watts. With that much power, it seems like RPI could well make it into North America. Lost in all of the packing & shipping of PRAs is the fact that I wanted to mention that I received the latest issue of The Spectrum Monitor. It's been a while since I've included it here . . . and I definitely need to. If you haven't seen TSM, it's essentially a continuation of Monitoring Times, except in PDF-only format. I think the fact that it's not on bookstore shelves and not passed among friends limits its new audience potential. To me, at least, it seems to be more a magazine for "those in the know." If you liked MT in the past, you're sure to enjoy TSM. You can check it out the wesbite here. The 2017-18 Pirate Radio Annual has 86 tracks listed in the book, but 87 on the CD. Those 86 tracks in the listing are correct, but the last track (#87) is not listed. 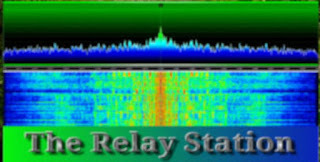 Track #87 is The Relay Station and I recorded it on October 1, 2016, on 5150 kHz at 2101 UTC. TRS doesn't often ID, so I was happy to catch this. I've been packing PRAs tonight & should have a 2nd batch ready to go out tomorrow. Probably most of these will be arriving at their destinations around the middle of next week. 2017-2018 Pirate Radio Annual is done and I've received the copies back from the printer already! This edition is 308 pages and contains an audio CD-R (playable on standard CD players) with clips from 87 different pirate stations from around the world, nearly all from 2016 and 2017. This edition contains 181 illustrations and entries for approximately 307 stations reported in North America in 2016 and 2017 (280 North American shortwave stations and 27 from Europe and South America). It also contains some "articles" on the Common and Precious Beacon, Radio Pirana International from South America, and upcoming Global HF Pirate Weekends/propagation for reaching different parts of the world. This edition will cost $20 ($16.50 + $3.50 shipping) in the U.S. I took the packed book to the post office for the international shipping cost and was shocked to discover that it will cost $24 to ship it anywhere in Europe (so, $38.00 = $16.50 + $21.50 to Europe) I'll eat a couple dollars of the cost because the shipping is so high. It's so expensive that it will soon pay for airfare to Europe just to deliver copies! This price is good for the next month (up through 5/1/2019). I'm not sure if I'll keep the price the same or raise it at that time. or send the money via PayPal to info [at symbol] hobbybroadcasting.com. If you trust that I won't run off with the money to Sealand, please use the "Friends and Family" option so that PayPal won't charge a fee. 4/2 update: One final note about ordering via PayPal: Could you please include your shipping address with the PayPal order? The PayPal messages haven't included addresses and when I sign into PayPal and click on the "more information about this transaction," the address still isn't coming up. So, I've been e-mailing people for addresses, which could delay shipping.